Prominent & Leading Manufacturer from Ahmedabad, we offer cnc waterjet cutting table, special cutting table, jetcut bridge cnc waterjet cutting table, cnc plasma cutting table, cnc glass cutting table and dwj 30 / 46 series bridge cnc cutting table. The CNC Waterjet Cutting Table is an automated table that consolidates the utilization of a hand held plasma cutter. It is very easy to keep up and offers an assortment of highlights. 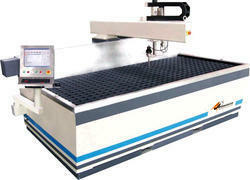 The brand of the plasma cutting table will decide the machines capacities. Every maker of a CNC plasma cutting table offers their own framework to run with it. The PC programming and so forth, is intended to cooperate with the table. All in all units, these frameworks can enhance your business by offering exceptional capacities which you can use to deliver unique artful culminations or claim to fame parts. The parts of Special Cutting Table should be planned and machined to cooperate. The rack mount and straight aides must work comprehensively together. The winding rack, pinion and direct drives must coordinate easily, quickening effortlessly and exactness. 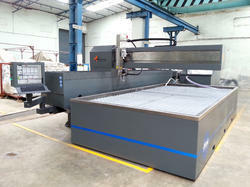 Your settling application is another critical thought that will saddle the maximum capacity of a quality plasma cutter. You ought to consider the general extension for future potential outcomes in light of the highlights pressed into the CNC machine. Does the application bundle incorporate a mix of arrangements and extension highlights? An adaptable machine bundle can take you far. Consider your requirements, long haul expectations and general objectives while picking a CNC plasma cutting framework. Organizations are continually hoping to extend each dollar and take full advantage of their representatives. The present economy has managers searching for each nickel. When the time comes to make the interest in another Bridge CNC Waterjet Cutting Table, quality, solidness, adaptability and cost are for the most part the main things that must be precisely considered. We as a whole have options and are searching as well as can expect a good purchase for our cash. Making a capital buy used to be simple. Realize what you are searching for, recognize what buying alternatives are, and have a thought of what you need to spend. Today, we have to settle on astute choices and know how it will impact our strategies for success today and for a considerable length of time to come. With regards to fast, exact and strong plasma cutters, one might say that an excellent plasma cutter with table like CNC Plasma Cutting Table is really the entirety of its parts. By building a plasma cutter with the best segments, building it as solid and steady as could be expected under the circumstances, and making it simple to set up and utilize, you have an impressive cutting machine. Plasma slicing machines must have the capacity to hold their promoted resistances today and, all the more critically, for a long time to come. Just all around outlined and well manufactured plasma cutters can make such claims. It begins with a substantial obligation and a completely welded plan that gives the most stable stage to precise plasma cutting. At the point when the base of the machine does not move amid cutting when kept on a CNC Glass Cutting Table, the plasma can cut your parts with unbelievable exactness. The plasma slicing table must be ready to deal with substantial plate loads and withstand thorough everyday use. You require proficient review apparatus to deliver proficient review items. Next, the segments should be outlined and machined to cooperate. At the point when these surfaces are accuracy machined and coordinated, the outcomes are a plasma cutter equipped for astounding exactness. Helical rack and pinion drives and best quality direct aides give unparalleled speeding up, movement smoothness and exactness. 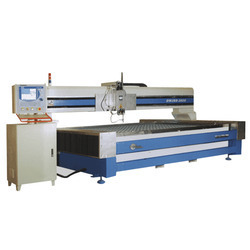 A DWJ 30 / 46 Series Bridge CNC Cutting Table is the way to the cutting procedure. On the off chance that the base moves or waivers amid cutting, you will experience difficulty accomplishing the exact cuts you require and the procedure will start to expend your opportunity. Pick an expert machine with a steady base. It will help guarantee exact slicing to create proficient review items. Next, the plasma burn and the light tallness control can be basic in deciding cut precision. You can generously build effectiveness with a plasma cutter that uses the most elevated quality programmed servo controlled circular segment voltage framework. You will accomplish a speedier reaction, shorter pre-stream times and more exact incorporation. We are the leading manufacturer and supplier of DWJ 15 Series Bridge CNC Cutting Table made from high quality material. The range of bridge CNC cutting table (DWJ 30 Series) offered by us are fabricated using high grade raw material that ensures optimum quality in the final product. Water jet machine uses cold supersonic abrasive erosion that helps to cut any materials such as metals and nonmetals. The highly pressurized water stream is provided that forced through a tiny area which carries abrasive garnet to erode away the material. Moreover, our range is can be selected as per the length width of the material. The Flying Arm CNC Cutting Table offers tedious capacities that are exact with every single cut. Spare the program for the particular venture and utilize it at later dates with affirmation that the finished result will be precisely the same like the one that was delivered some time recently. Presently, independent ventures can build profitability while dispensing with generation expenses and waste materials. Having the capacity to utilize a greater amount of the materials by removing every required component of a similar sheet can spare an organization a lot of cash at last. Essentially, you can bring down your generation costs while raising your benefits. Presently, that is the best approach to work together. 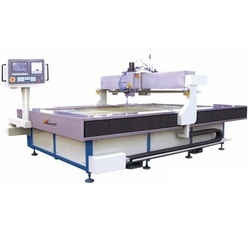 The Bridge CNC Cutting Table is utilized to introduce and work plasma cutting machines which are then controlled by programming. It is constantly introduced with gears, which furnish the plasma cutter with exceptionally precise movement towards any path. It takes into consideration exact cutting of the metal. The producer of the plasma cutting tables will supply the product to run the framework as well. The product will enable you to control the framework completely. Utilizing it you will have abilities in cutting of metal that would have been incomprehensible. This implies more business. Plasma slicing tables can be designed to perform monotonous errands through the programming of the product. You can utilize the slicing table to cut some special stuff and after that spare the operation for later utilization. 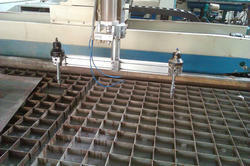 Looking for CNC Waterjet Cutting Table ?